Relationships and networks have a big impact on parliamentary engagement. Understanding these dynamics is crucial for those academics looking to work with Parliament as part of disseminating their research. Marc Geddes, Katharine Dommett and Brenton Prosser outline why academics must be able to “rub shoulders” with parliamentary staff, building shared understandings and personal trust which can circumvent common barriers around accessibility of research. Depending on your perspective, think tanks either enrich the democratic space by conducting policy research and facilitating public dialogue and debate, or undermine democracy by pushing policies favoured by powerful corporate interests. Till Bruckner explains how Transparify are contributing to debate about think tanks’ role in evidence-based policymaking by assessing their levels of financial transparency. The Transparify report enables citizens, researchers, journalists, and decision-makers to distinguish between legitimate policy voices and questionable sources of “expertise”. The complex, “wicked” problems that afflict contemporary societies pose a significant challenge to those making policy decisions. The work of social scientists can be crucial to understanding the human and social consequences of such decisions, yet little guidance exists to help them bring their influence to bear. Nadine Marshall and Chris Cvitanovic have compiled ten top tips for social scientists seeking to increase their influence in the policy arena; emphasising the the importance of process, engagement, empathy, and acumen. Within the social sciences, translating and sharing new knowledge is now common practice amongst many researchers and institutions across academia. From evidence briefings and summaries of literature to online blogs and presentations, a wide range of research evidence aims to engage policy and practitioner audiences so they can more easily access and use the evidence. Raj Patel questions whether it is adequate to simply communicate findings, and proposes a model for adding value to research in a way that is more likely to generate impact. Effective communication of research is often cited as being most important to gaining the attention of policymakers. This arguably underestimates the sheer complexity of the policymaking process, assuming a linear route from evidence to policy and practice. Fiona Blyth and Carmen Huckel Schneider explain why breaking down walls between different academic disciplines could enhance our understanding of why research evidence does or doesn’t make it into policy, and also suggest questions that researchers might ask as a “gateway” to understanding these different approaches to evidence-informed policymaking. In many cases policymaking is conducted without engaging with the public. It is economic measures, rather than any official public consultation, that inform monetary policy, for example. But does this contribute to the perception of policymakers as “out of touch”? Emmanuel Lee argues that policymaking must become more empathetic, with aggregate economic measures often failing to accurately reflect the wellbeing of the individuals who make up the economy. Greater use of qualitative research, including radical methodologies such as ethnography, would help; as would the development of new, more holistic measures of wellbeing. Among the ways social sciences research can have impact is by influencing public policy. Duncan Green reports from an event at which this subject was much discussed, with a leading government research analyst offering clear advice on what officials are looking for. Comparative work highlighting a range of possible solutions is valued, as are multidisciplinary approaches. Most useful is demonstrating where something has or hasn’t worked and why. Make written work short but not dumb, avoid jargon, and quickly get to the point. Beyond that, a researcher’s attitude, accessibility, and understanding of the rhythms of policy decision-making are all important. Connecting research with policy is never easy, particularly in low- and middle-income countries (LMIC) where resources are often limited. Sarah Morton conducted an impact assessment of a research programme in Peru to examine how research uptake and use contributed to policy and practice change. A number of recommendations arising from this case study can be applied to future research programmes looking to maximise impact. These range from the need to plan an “impact journey” including key outcomes and monitoring criteria at the outset; through the importance of local/national stakeholder mapping and regular communication; to the identification of key staff in knowledge-brokering roles who can understand and navigate tensions, and offer a more strategic approach to research impact. Having an impact on policy is an important part of demonstrating the wider contribution of academic work and expertise. 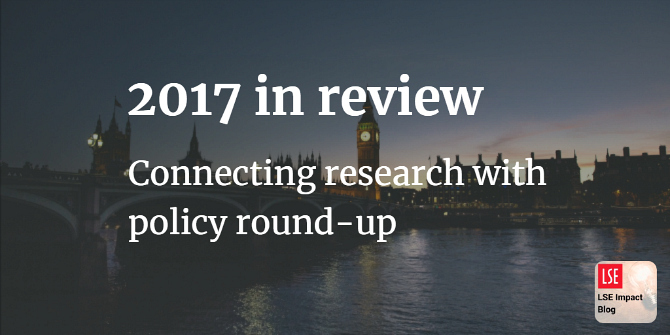 The Policy Fellowships Programme was set up as part of a wider commitment to find increased and better ways for scientific expertise and evidence to be considered in public policy. Nicola Buckley and Charlotte Sausman explain the background to the programme, emphasise the importance of facilitating relationships which develop over time and across many interactions, and reflect on some of the key factors to success. These include a focus on policy questions posed by policy professionals, the active engagement of researchers from all disciplines, and input from beyond universities. Try explaining these joyful explanation to a party whip!